It didn’t take long for Gordon Beckham to prove to the White Sox that he was ready for the major leagues in 2009. The eighth-overall pick in the 2008 draft (second Beckham overall, behind Tim) made his major league debut just 364 days after being drafted. The University of Georgia product didn’t disappoint, as he hit .269/.347/.460 (AVG/OBP/SLG) with 14 home runs and 63 RBI in 103 games. He was named American League Rookie of the Year by The Sporting News and the Major League Baseball Players Association. Beckham, a shortstop in college, played third base exclusively at the major league level. If we stretched his 14 home runs and 63 RBI over a 162-game schedule, we get a projected total of 22 home runs and 99 RBI. Those numbers are not bad for a third baseman, but fall well below the top producers at the position like Evan Longoria and Alex Rodriguez. With the acquisition of Mark Teahen this off-season, Beckham will try a new position in the majors; second base. If we take those same 22 home runs and 99 RBI, and apply them to second base, only Aaron Hill of the Blue Jays topped those numbers at the AL keystone position last season. 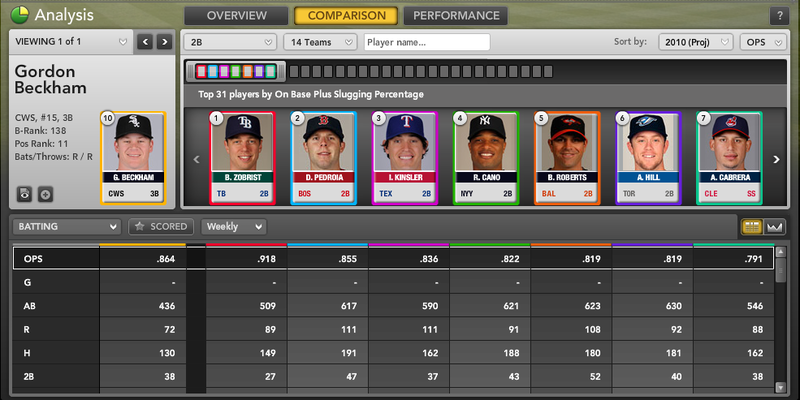 Looking back at some batted-ball data from 2009, we can get a feel for Beckham in 2010. Among numbers we like to look at as “fluke” stats, namely batting average on balls in play (BABIP) and home run-to-fly ball ratio (HR/FB), Beckham scores well. 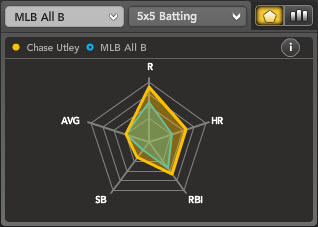 His .290 BABIP was slightly below average, and could jump over .300 with more line drives (16.6% line drives last year). 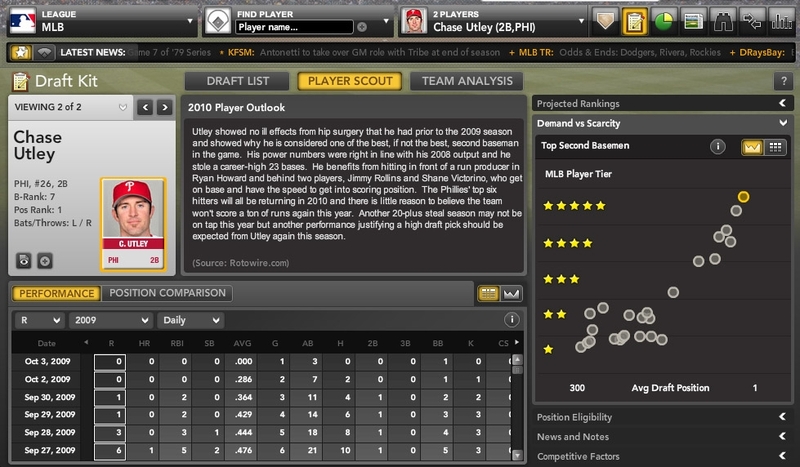 This would bring his batting average closer to the .280 mark. Beckham will play a full season at U.S. Cellular Field in 2010. The home of the White Sox had the fourth-highest home run rate in 2009. Because of this, it’s possible that Beckham’s HR/FB rate could move up, placing him among the league’s top power-hitting second basemen. Another good sign from Beckham was his patience at the plate. 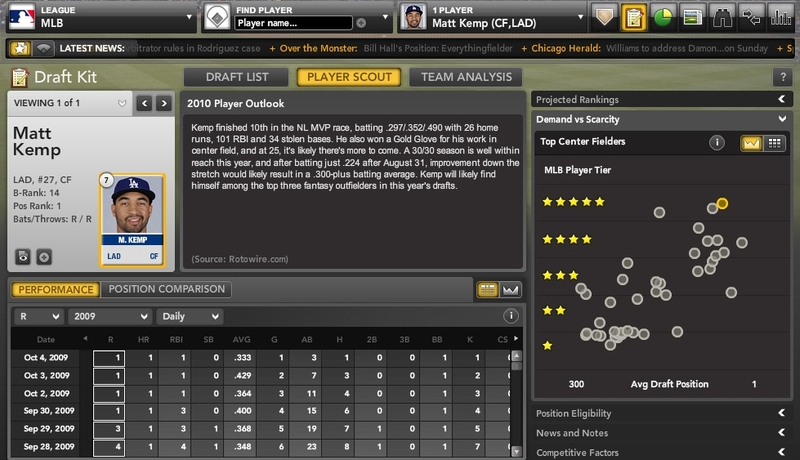 He struck out 17.2% of the time last season, but he also walked nearly 9.5% of the time. 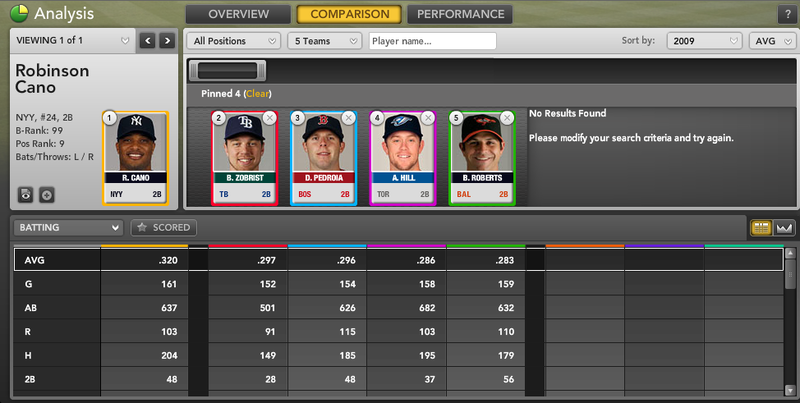 For reference, Evan Longoria walked 9.1% of the time as a rookie, but struck out 27.2%. With a sharper batting eye, Beckham could increase his walk total, bump up his OBP, and create more run-scoring opportunities. 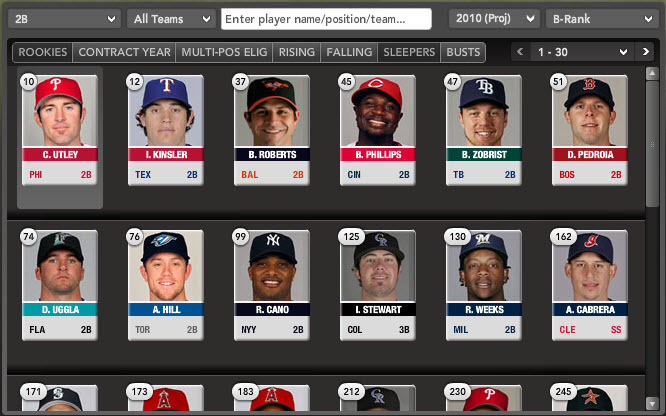 Beckham’s average draft position (ADP) was 88.2 before Opening Day, which would rank sixth among AL second basemen behind Ian Kinsler, Brian Roberts, Dustin Pedroia, Ben Zobrist and Robinson Cano. He’ll need to meet your league’s in-season eligibility standards first – but that’s impressive company. 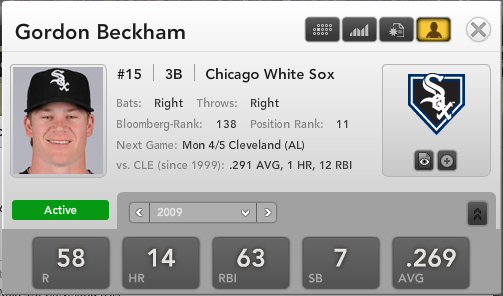 Looking at Bloomberg Sports’ projections, Beckham’s .864 OPS in 2010 is projected as second-highest figure for AL second basemen. 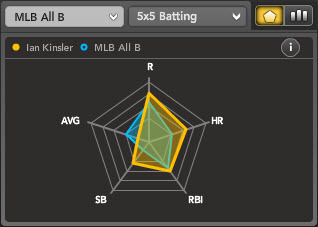 Because he played third base last season, Beckham will carry multiple position eligibility that Kinsler, Roberts, Pedroia, Cano, and Hill don’t have. Though your draft has ended and the season has begun, see if you can pry Beckham loose from a leaguemate with a well-timed trade offer. The move could prove a big help to your 2010 fantasy team. 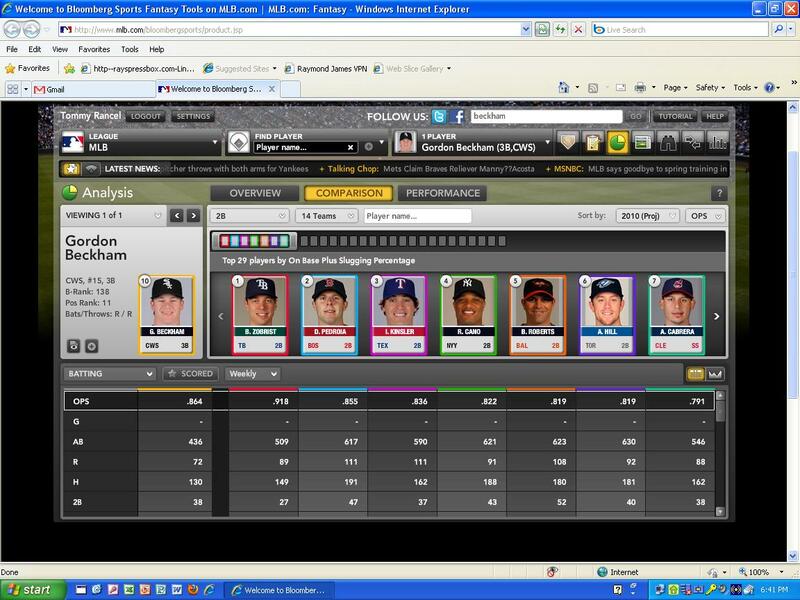 For more on Gordon Beckham and other players switching positions in 2010, check out Bloomberg Sports’ fantasy kits.